The ANRT (national association for research and technology) has made an international comparison of research jobs in companies which benefited from the French research tax credit in 2015. Here are the results. The research tax credit (known as CIR) is a measure to support R&D activities in companies. The rate varies depending on the amount invested. The aim is to encourage R&D by reducing the risk of technological development in France. 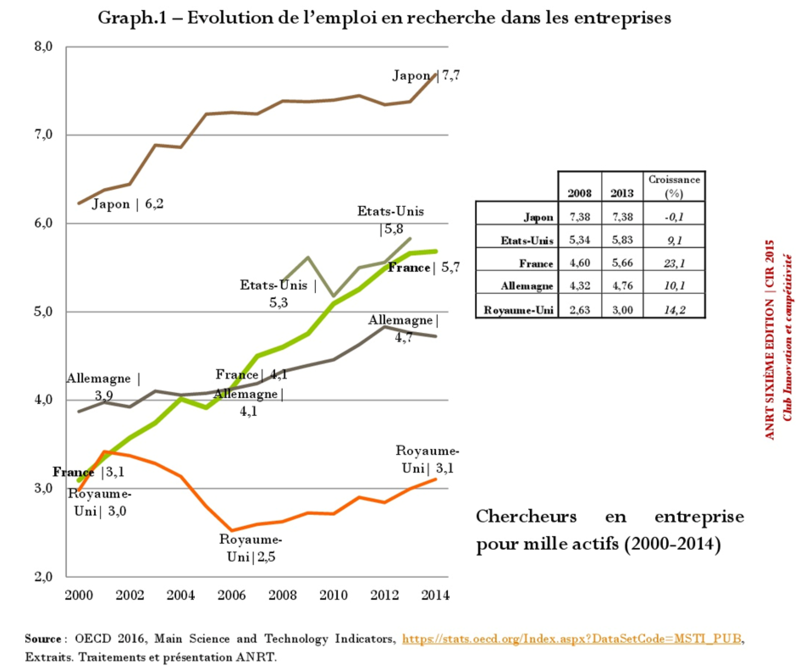 Between 2008 and 2013, and thanks to the CIR, company research jobs grew at a faster rate in France than in other countries with high levels of research. Though other countries have their own measures to encourage such hiring, they have had less impact than the French CIR, which has proven to be a powerful incentive. For example, every year, 1,300 PhD students find their first job thanks to a specific CIR aid for young researchers. With 5.7 company researchers for every 1000 employees, and a long-term strategy to boost investment in brainpower, France seeks to create a virtuous circle in industrial research. More information about French R&D, contact us !